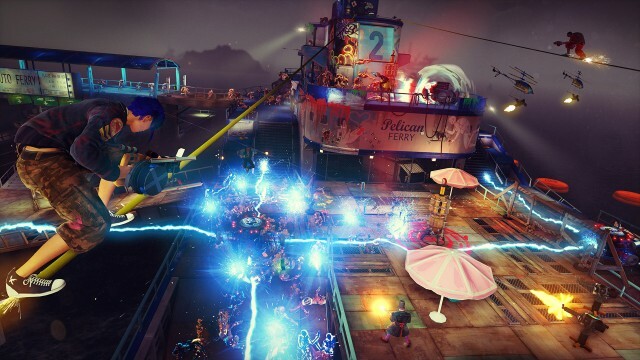 Throw traps, shoot guns, grind rails: that's the Sunset Overdrive way. Update: There's no shortage of new games this 2018 holiday season, but we wanted to bring a surprise gem to your attention: 2014's Sunset Overdrive, a high-octane, parkour-driven visual stunner. With seemingly zero fanfare, a $20 PC version arrived yesterday for Windows PCs (Steam, Windows Store). Nearly everything about the original games still applies to this PC version, so enjoy our original review (which first ran on October 29, 2014) below. The piece appears largely unchanged, but we have added some PC-specific thoughts (finally, Sunset in 60fps!) and a gallery from the new edition near the end. Keep moving, keep moving, keep moving. If I stay still, the monsters attack. If I stop sliding down rails, bouncing off of car hoods, or rappelling over zip lines, everything falls apart—the music in my head stops playing; the electricity stops surging through my dodge-rolls; the fire stops spewing from my duct-taped battle-axe. Welcome to Sunset City, a sunny, dilapidated corpse of a not-so-futuristic riverside metropolis. The place used to be overrun by selfie-snapping hipsters until they chugged a brand-new energy drink that turned them into crazed mutants (we mean literally, as opposed to the figurative craze of a caffeine high). Somehow, "you" (by way of a relatively robust character creator, which happens to sport the dumbest hairstyles known to man) avoided taking a sip, and now you must survive and escape the madness alongside the few remaining human survivors.